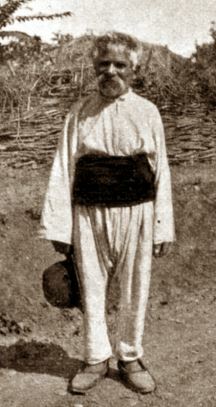 This photo of an eighty-year old Bulgarian from Boltaşi, a village near Afumaţi, was taken by Gustav Weigand in 1899. Weigand wrote about him that he “represents the true Bulgarian both in facial features and garb. The latter consists of a coarse linen smock and pants. A very long red woolen band is wrapped around his waist. This band is characteristic of Bulgarians as well as of Turks. Whenever one encounters it on Romanians, which can also happen, it is a Bulgarian borrowing. Bulgarian influence can be discerned in other aspects of clothing as well (Weigand, G. 1900: 118). 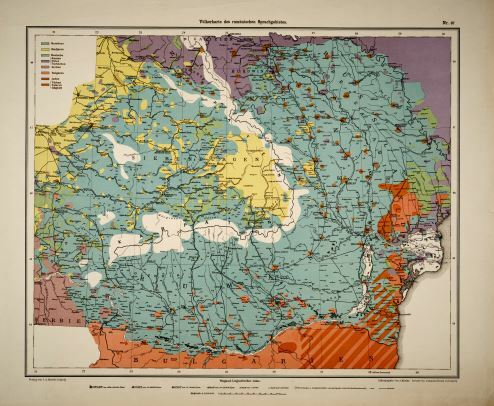 The texts included in the Corpus show the Transdanubian dialects as they were at a specific point of their history; namely in the 1960s and 1970s. During his fieldwork in 1962–1975 Maxim Mladenov did not encounter speakers of Bulgarian in some localities where his sources claimed that Bulgarian was spoken. Negative information of this kind is presented in this section according to Mladenov’s field notebooks and his monograph. The map summarizes the available information about Transdanubian localities in which Bulgarian was spoken in the past or continues to be spoken today. Two types of localities have been included: 1) localities with 25+ Bulgarian households, for which only early nineteenth-century information is available; and 2) localities mentioned in sources spanning over longer periods of time. Analysed in Косев, Д., В. Дикулеску, В. Паскалева 1965 and Kosev, D., V. Paskaleva, Vl. Diculescu 1971. The 1834 taxpayers’ registry, apparently including only the more prosperous households from thirteen counties, is among the informative early nineteenth-century sources. This registry reflects the whereabouts of Bulgarian population after an agitated period when many Bulgarian families were moving from one locality to another and some had even returned to their initial places of residence on the other side of the Danube River. The most precise and complete primary source from the first half of the nineteenth century is See about it Donat, I., G. Retegan 1965 and Velichi, C. N. 1965. the registry of the population prepared by Romanian authorities in 1838. Unfortunately, its parts, dealing with Ialomiţa County and the Dumbrava District of Dolj County, have not survived until our times. The total number of Bulgarian households, referred to as “Serbian” in this source, is 11 756 (Velichi, C. N. 1965: 108). Information from a large number of early sources has been summed up in Roman, L. 1984. Bulgarian Academy of Sciences, Research Archive, F.130k Stojan Romanski’s archive contains information about the Transdanubian dialects as they existed at the outset of the twentieth century. While visiting Transdanubian localities in 1906, 1908 and 1918, Romanski took notes in places where, later on, Bulgarian was no longer spoken (Жечев, Н. 1983). He also prepared a Cf. Младенов, М., Б. Нягулов, Н. Жечев 1994: 244–253. statistics of Transdanubian Bulgarians. The Transdanubian data available in Romanski’s archive and in his Романски, С. 1914; Романски, С. 1918; Романски, С. 1930; Романски, С. 1935 publications is also taken into account in this section. Interviewing Transdanubian people, Romanski strove to tap the oral tradition regarding the history of settlement and the origin their ancestors. An overview of the localities with a compact Bulgarian population in Southern Romania at the beginning of the twentieth century is also available in Gustav Weigand’s Weigand, G. 1900; Weigand, G. 1909 publications. Cf. Weigand, G. 1909: Map 67. Weigand’s map of the ethnic groups with which Romanians coexist presents special interest. The map was scanned from Weigand’s atlas in the holdings of the University of Toronto Thomas Fisher Rare Book Library. The Lahovari, G. I., C. I. Bratianu, G. Tocilescu 1898-1902 “Great Geographic Dictionary of Romania” offers useful information about individual localities with Bulgarian population at the end of the nineteenth century. Although Transdanubian Bulgarians are mentioned in this source only occasionally, there is one locality with Transdanubian population (Segarcea din Deal) not discussed elsewhere in the documentation at our disposition. This is a sign that the number of Transdanubian localities in fact exceeds current knowledge and the exploration of additional publications and archival materials will expand it. The detailed study of the history of Transdanubian Bulgarians is a task for the future . The data in this section forms a backdrop to the dialect texts in the Corpus and enhances our understanding of the parameters of the Bulgarian presence in southern Romania. It documents the existence of Bulgarian dialects no longer in use and makes it possible to assess more thoroughly the impact of language contact with Romanian on the Transdanubian dialects. Author of the text: Olga Mladenova. Author of the map: Vesselin Stoykov. If a portion of the text is underlined with dots, click on it to see additional information, such as bibliographic references cited in the text, comments etc. Transdanubian Bulgarian population in the past. Gustav Weidand's data from the end of the 19th and the beginning of the 20th century. Stojan Romanski's data (1906-1918). Maxim Mladenov's data (1962-1975). Dialectology. Website statistics: Currently 2 visitors are online. Unique visitors: 21607. Total visits: 558932. Daily visits: 263.